It’s been a long time since I featured a designer honored with a plaque on the Fashion Walk of Fame in the Garment District of Manhattan. With three royal weddings this year, I feel I have been spending plenty of time looking at hats and fascinators all of a sudden, so it seemed the milliner Lilly Daché would be a good choice to revive the “Fashion Walk of Fame” posts and share a little fashion history with you. 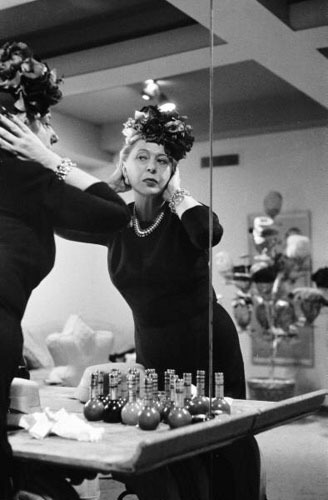 Lilly Daché was one of the world’s most successful milliners. Working in New York, she utilized techniques learned in her native France. Her hats were characterized by bold, sculptural shapes, which required complex blocking. Many were also decorated with seductive veils and trimmings. Most famous during the 1930s and 1940s, when a chic hat was at least as important as a stylish dress, Daché was a milliner extraordinaire. Lilly in the mirror, checking her look. Photo © 1956 Leonard McCombe/LIFE Magazine. 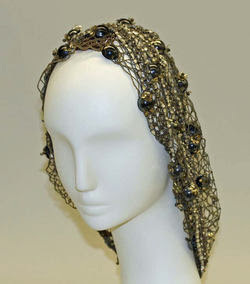 A black feather hat by Lilly Daché, 1939-1940. Photo courtesy of The Metropolitan Museum of Art. An evening snood by Lilly Daché, 1940s. Photo courtesy of The Metropolitan Museum of Art. 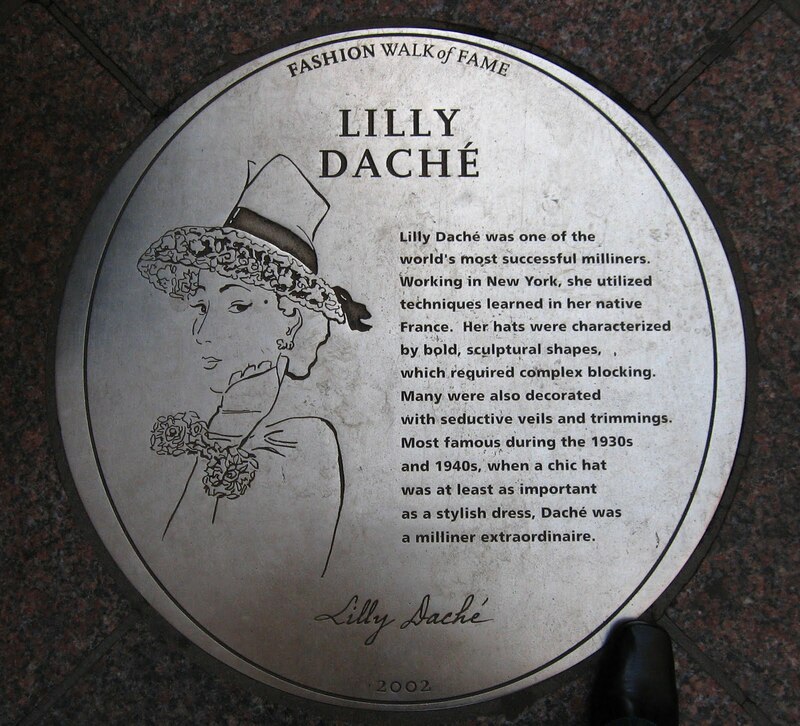 Lilly's plaque is on Seventh Avenue in NYC, between 37th and 38th Streets, next to the designers Mainbocher and Willi Smith. The feathered hat is lovely! I didn't know they had designers honored on plaques like that in NY. How many of these plaques are there about New York? I wasn't familiar with her....so I love this post...thanks for sharing this!! Maybe you could bring us regular posts on some of the other designers there!! I love, love, love hats! This would be so much fun to see when in NYC--millinery is an art we shouldn't lose. Thank you my dear friend for your warm welcome. It is soooo nice to come home to my dearest friends. Hi Veshoevius, yeah, the plaques are on Seventh Avenue, in the Garment District of NYC and feature New York designers. I am going to start featuring one designer a month who was honored with a plaque on the Fashion Walk of Fame. It's a great lesson in fashion history! Hi Terri, there are 26 plaques and the two most recent recipients on the Fashion Walk of Fame are Diane von Furstenberg and Liz Claiborne. I couldn't find their plaques when I was looking last year so I will have to go back into the city to track them down! Hi Pam, I learned a lot just walking and taking pictures of the plaques. I hadn't heard of Lilly Dache before I saw her plaque and also wasn't familiar with Charles James. I like your suggestion so I'm going to start featuring one designer a month to share what I'm learning about the history of fashion in New York. Hi Jeanne! 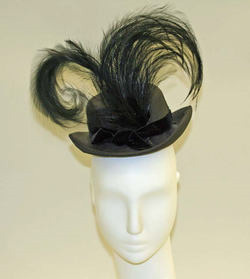 I thought that feathered hat was great, so jaunty and fun, I think the right person could wear it today! They have a ton of other pictures of Lilly Dache's work on the Met's website. It's a great resource. Hi Catherine, I hope your vacation is fun so far! 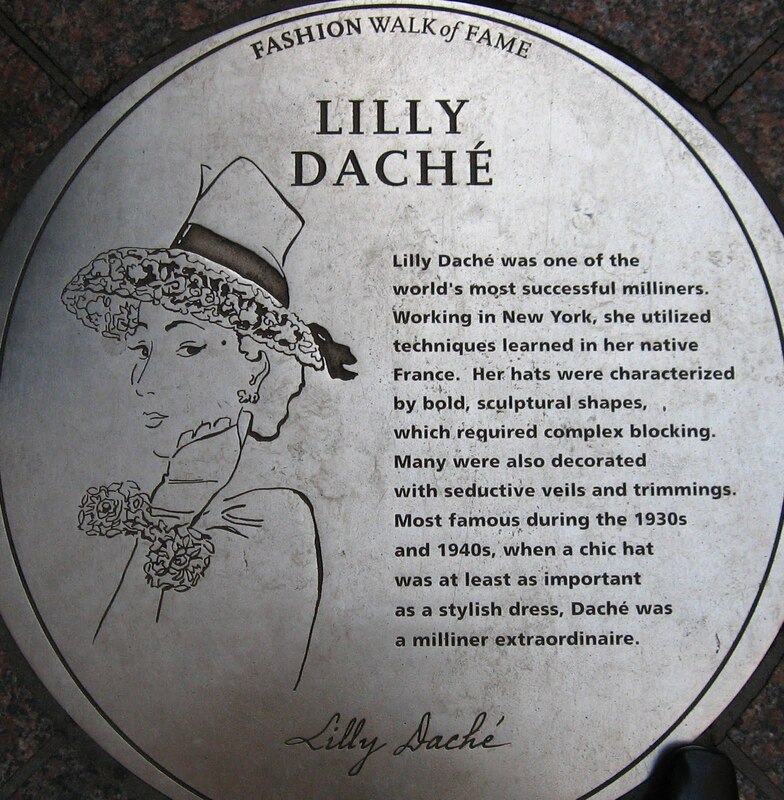 I think you are somebody who could wear a Lilly Dache hat today and make it look so chic. Sacramento my dear, I am so happy to hear from you again! I loved the pictures from England and are so glad you are sharing them with us. I missed you while you were away!